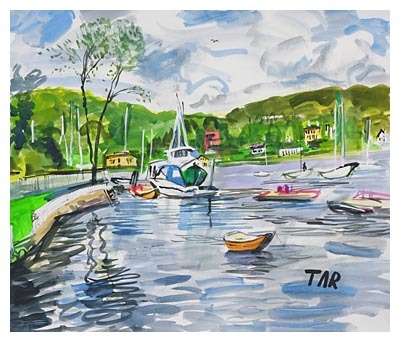 "From the Dock" is a beautiful watercolor created by Laszlo Tar in 1998. The scene is at the Cold Spring Harbor dock, looking west. Cold Spring Harbor is a historic village in Huntington, New York -- on Long Island. In the distance on the right are some the many buildings of the Cold Spring Harbor Laboratory and straight ahead are the romantic marine vessels standing await in the harbor. Laszlo Tar lived just a short distance from the spot depicted in this work, and his son would drop him off to paint and later pick him up. A really wonderful piece! As with all of his works, Laszlo Tar completed this fine piece on location.